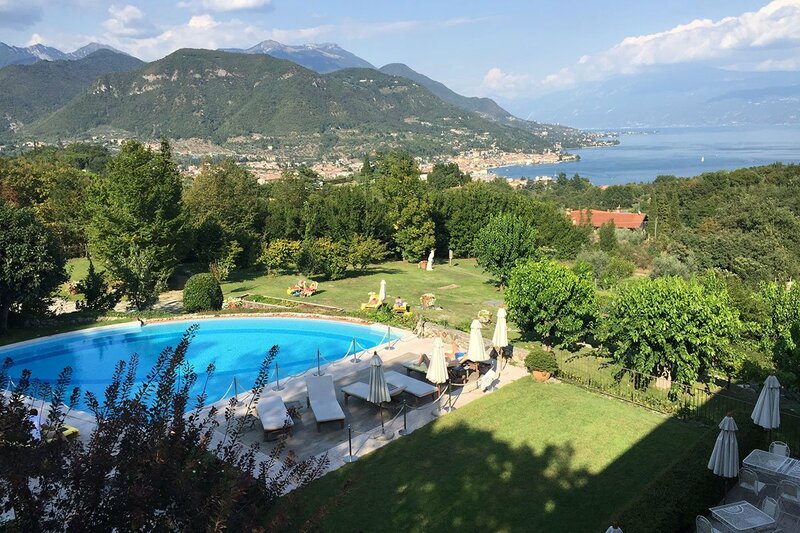 The view of Lake Garda from Villa Arcadio. All photos by Victoria Lewis. Victoria Lewis is covering Italy from tip to toe. She started on the southern coast with a beautiful report of simple, sunbaked Puglia. 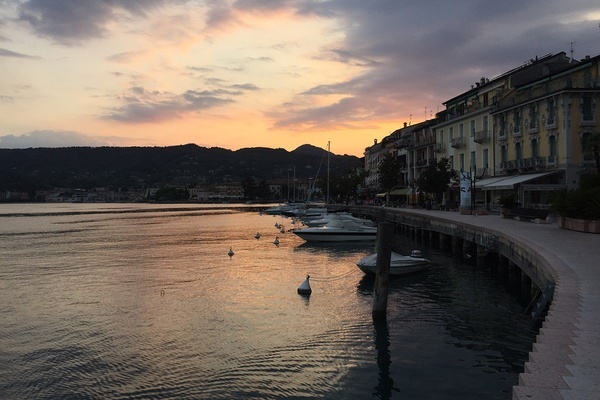 She checks in from the north with an itinerary for the low-key lakes in the Italian Lakes District. LAKES DISTRICT, Italy – When my boyfriend and I told our friends that we were planning to spend a few days in the Lakes District of Italy, their inevitable response was: "Oh, Lake Como?" No, not Como. Garda and Iseo, we'd explain. 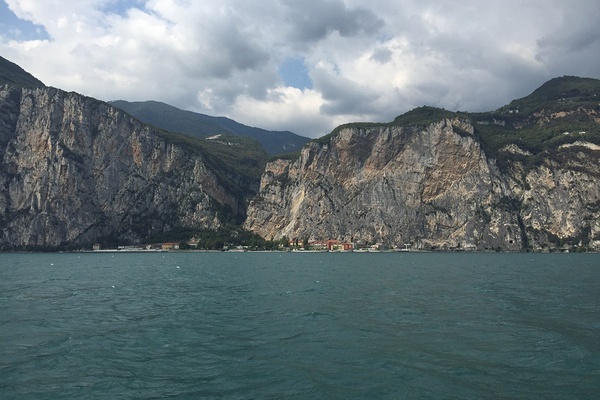 Lake Garda is Italy's largest lake at 143 square miles, almost three times as big as Como. But, as the locals will tell you, Como is the most famous because of George. (Clooney that is.) So, while the glamorous shores of Lago di Como continue to attract international tourists, the region's other lakes — Garda, Iseo, Maggiore, and Lugano — have become popular with more local European travelers: Italian, German, Swiss, Dutch, and British. Each lake has a personality of its own. Garda has a handful of charming little towns to explore and crystal clear waters perfect for swimming. Iseo is much smaller and less polished, with a distinctly laid-back, local vibe. Iseo also abuts the northern edge of the Franciacorta wine region, famous for sparkling wine made in the Champagne method. Needless to say, if water sports aren't your thing, you'll find plenty of good food and drink to keep you occupied. Between hiking, biking, boating, spa-ing and lots and lots of eating, we could easily have spent a week or more at each destination. But, with only four days to fit everything in, we opted to spend two nights in each location. The author sunbathing on Lake Garda. The view of the vineyards from a 40km bike through Franciacorta, south of Lake Iseo. The lake is beautiful and its scenery is best enjoyed from the water. Pack a picnic and a bottle of wine and head to Zanca in the town of Salo to rent a motorboat (boat license not required). We chose the half-day rental and ended up wishing we had more time to explore. Splurge on the full day if you want time to check out the varied coastline of the lake. Cool down with a quick dip in the clear water before heading back to shore. The mountains around Garda offer hiking trails for all different levels. Many of the best hikes can be found to the north of the lake (and on the lake website). When conditions are right, windsurfing, kitesurfing, paddle boarding, sailing, climbing, and mountain biking can all be arranged as well. Check with your hotel for the best local vendors. Early evening is a great time to take a walk through town and post up at one of the many lakeside cafes for a cocktail. Order an Aperol spritz, the official drink of the region (if not all of Italy), and watch the sun set over the water. You could pack every day full of activities, but part of the appeal of lake life is finding a little time to do nothing at all. We opted to spend the late afternoons reading by our hotel pool and napping in the sun. It was perfect. For a pizza fix in the town of Salo, Papillon has a large menu and pleasant lakeside seating. At dinnertime, avoid the touristy waterfront spots and head further into town. At Osteria dell'Orollogio, you'll find a totally authentic menu and an energetic, local atmosphere. 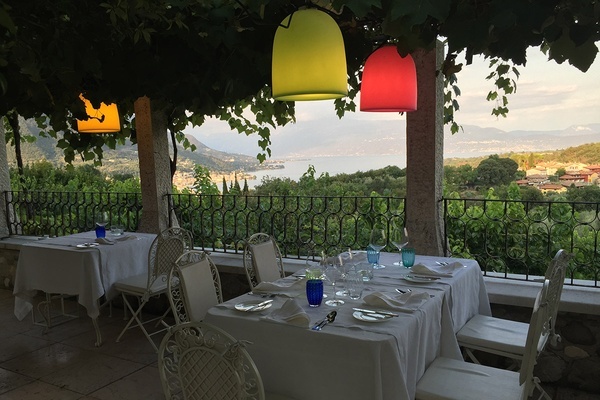 For finer dining, head up the hill from Salo to Ristorante Villa Arcadio. If you happen to arrive before sunset, you'll be rewarded by a pretty amazing view of the lake and town below. If you can, order the local Suler wine. It's fantastic. Just a few minutes above the lakeside village of Salo, you'll find the unassumingly luxurious Villa Arcadio. Don't let it's understated décor fool you, the hotel has surprisingly sprawling grounds, complete with a hilarious fitness course through an olive grove, a lovely pool, and unexpectedly plush beds. Bonus points for the never-invasive but extremely attentive service. The view of Salo from Lake Garda. Some of the best hotels in the region are located a few miles from Lake Iseo, among the vineyards of Franciacorta. Earn your afternoon pasta with a morning bike tour of the region. We took a strenuous three-hour, 40-kilometer ride through the hills with a guide. It was definitely a challenge for someone who doesn't do much SoulCycle. If that level of exertion doesn't appeal, try a more mellow walking tour instead. We spent a great afternoon wandering down country roads and learning about local history with our guide Andrea from trekking company Millemonti. 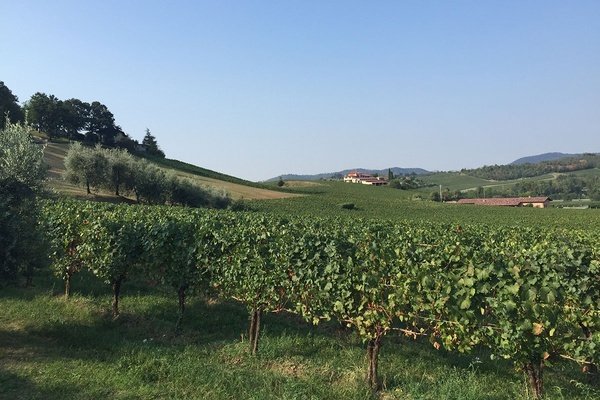 Ask any local wine maker about the difference between Prosecco and Franciacorta and you will get an hour-long education on the finer points of sparkling wine production. What you need to know: Franciacorta, like its French counterpart Champagne, enjoys a secondary in-bottle fermentation process. Prosecco is aged in a tank, and only for a few months before it is bottled and sold. In other words, Franciacorta is far more complex and flavorful. You'd be remiss to leave without trying a bottle or two. We stopped in for tastings at two great wineries. The first was Villa Franciacorta, a beautiful property built on top of a restored 15th-century hamlet. Originally founded in the 1960s, the winery is now run by the founder's daughter Roberta Bianchi, who was kind enough to show us around for a tasting. The winery has lovely grounds and a delicious, unassuming restaurant Trattoria Borgo, where we enjoyed a lunch of local cheese, meats, and pastas. Berlucchi, only a few miles away, is a significantly bigger winery (they produce about five million bottles compared to Villa's 300,000) but just as charming. There, we got to tour the cellar with Cristina Ziliani, daughter of one of the original founders. If you get a chance, take peek into the property's historic mansion. The Spa Espace Henri Chenot at L'Albereta Hotel is world famous. Many travel to the region just to spend a few days undergoing their rigorous health and wellness program. We opted to avoid the strict, plant-based, low-gluten Chenot diet (we were on more of a carb-only program in Italy), but did make time for a hydrotherapy treatment, mud wrap, and massage. 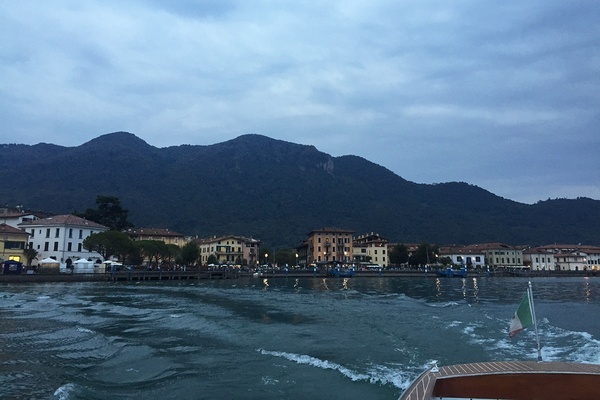 Like with Garda, the best way to see Iseo is by boat. In the middle of the lake, you'll find Monte Isola, a large island where motorbikes and bicycles are the only approved modes of transportation. There are also two smaller privately owned islands with beautiful homes built on them. In the summer of 2016, Monte Isola and Lake Iseo will be home to an installation by artist Christo. Iseo and the Franciacorta region attract top chefs from around the country. For upscale dining, Leonefelice at L'Albereta Hotel and Cucina Francescana at Cappuccini Hotel both have highly inventive menus with many modern takes on traditional Italian cuisine. For something more laidback, Trattoria del Muliner in Clusane is a chic, contemporary space with seriously good pasta and fish. A five-star Relais & Chateaux property, L'Albereta takes the whole idea of country manor chic to the next level. Mixing classic style with modern accents, the space is impeccably designed and has service to match. Settle in for a sunset cocktail on their terrace overlooking the valleys of Franciacorta and you may never want to leave. 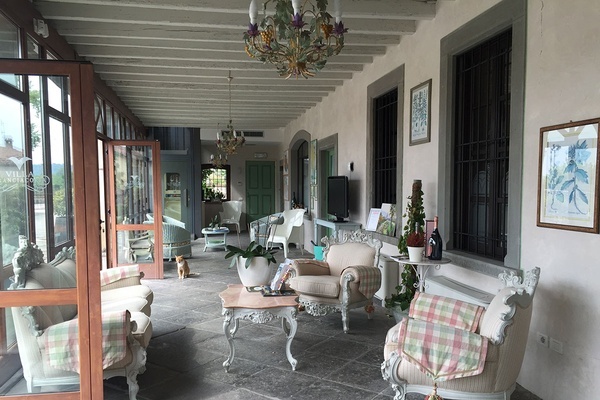 The charming reception at Villa Franciacorta. 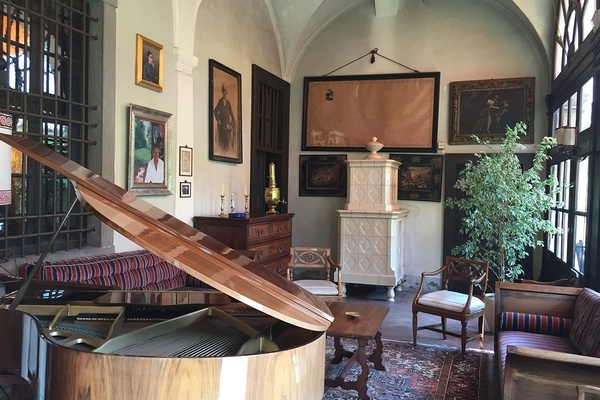 Berluchi Mansion, home of Guido Berluchi, the original owner of Berluchi winery. Day 1: Fly to Bergamo Orio al Serio airport. Drive to Villa Arcadio. Visit the town of Salo for an aperitif. Dinner at the hotel. Day 2: Spend the day on a boat on the lake. Take an afternoon hike. Dinner in the town of Salo. Day 3: Drive from Garda to L'Albereta. Visit Villa Franciacorta on the way. Take an afternoon walk through the vineyards. Dinner at Leonefelice at the hotel. Day 4: Wake early for a bike ride around Franciacota. Winery tour and lunch at Berlucchi vineyard. Afternoon at the Henri Chenot Spa. Evening cruise around Lake Iseo. Dinner in Clusane. Located between Milan and Venice in Italy's north, both Lake Garda and Lake Iseo are easily accessible from many national and international airports. Flights are available daily from the US to Venice Marco Polo airport (VCE) and Milan's Linate (LIN) and Malpensa (MXP) airports. More direct flights are available from within Italy and the surrounding region to Verona-Villafranca (VRN), Brescia (VBS), and Bergamo Orio al Serio (BGY) airports. Though it is possible to access the lakes via train or bus service, a car will give you more freedom to explore the countryside and travel from lake to lake. Rental cars are easily available at all area airports. Although they are most popular in the summer months, the lakes can be considered year-round destinations. For an ideal experience, go in May or September for mild weather and fewer crowds. Just be sure to bring a sweater as nights can bring chillier temperatures. Do It Like an Italian. Escape to Puglia.